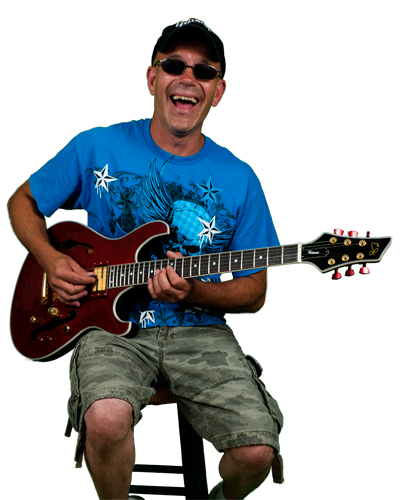 Danny has been a musician in the Cleveland Area for years and is currently a guitarist/singer for The Acoustic Trio (GPS). He's currently collaborating with Chad Ely's Multimedia Group on an original project and is working on CD's and videos with the band Bound For Rehab. After being shot by a 22 pistol when he was a teenager, he spent three months in a hip cast and months in therapy. It was then that he decided that entertainment is a universal tool for those who are disabled and began to pursue a music career. His first band was with his high school friends in a group called Lyar as a singer and lead guitarist. The band was a local success, playing school dances and college parties. They soon experienced a series of rock-style life tragedies: Their first roadie was killed in a motorcycle accident. Later one of their friends was killed in car accident, followed by the band's lead singer and guitarist passing away from a heart condition four months later. The band went their separate ways, and Danny started looking to re-discover what he had lost. After being permanently disqualified from every branch of the military for having a bullet in his leg, he turned back to music and formed a band called The Storm. The band was short lived with members heading off to college in search of more solid careers. Danny then helped form a few other local bands, including Fana-C-Lane and Crazy Face, but decided to settle into a more stable job as a land surveyor and play, produce, and record music at home – just for the shear fun of it. Then, one day, his father-in-law asked him to sit in on an open mic acoustic jam to fill in for the guitarist who couldn't make the gig. Out of that one performance came the birth of Acoustic Trio GPS and 12 years of playing open mics, charities, wineries and bars. During this span, Danny also formed an all-originals group called Bound for Rehab which has been together for 10 years making CD's and YouTube videos, playing some local venues, and getting some local radio airplay for some of their songs. In 2010, after the tumbling economy cost him his day job, Danny decided to focus full-time on music and joined a band called Hooray for Tuesday for a while. More recently, he re-united with high school pal Chad Ely at the Ely Multimedia Group and enjoys hosting open mic night on Wednesdays to give local musicians an opportunity to try out their material. To know more about Danny, visit his website and his Facebook page .